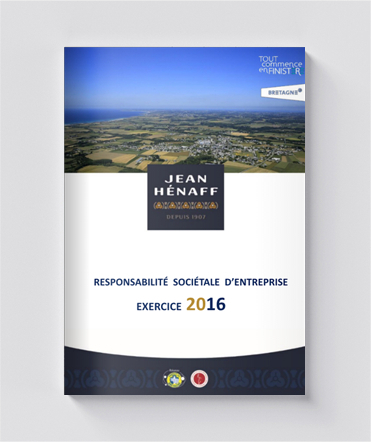 Corporate values – this is the core concern shared by all Jean Hénaff associates and employees. These values underpin the pursuit of excellence at the company, as well as being a strong cohesive force. Whether within the company itself, or as part of its relationship with suppliers at its sourcing chains, the key word is respect. Respect for persons and for all the people involved in our business. A genuine dynamism that drives each individual to move forward and take initiatives, with the focus on progress and continuous improvement. Working methods, technologies, creativity: in every sector, there is the same drive to innovate, the same level of energy put into deploying the company’s “High Product Quality” (HPQ) policy. Never forgetting, though, the importance of offering a welcoming and convivial working environment. At Hénaff, this is a keystone concept: you have to get on well together if you want to achieve excellence! A policy that supports permanent employment contracts (94% of the workforce in 2017). A strong training policy designed to give our company the means to achieve its ambitions and guarantee the employability of its workforce: 2.36% of the payroll is devoted to training (the legal minimum is 1%). A firm focus on values of respect and sociability at every level of the business. While our company prioritises permanent employment contracts this does not guarantee an employee a job for life. On the other hand, we will take the time to listen to you and help to foster your employability and personal development and fulfilment in a convivial atmosphere that reflects one of Hénaff’s core values. Lastly, Jean Hénaff makes every possible effort to reply promptly to all unsolicited applications (trainee course, permanent or fixed-term job applications). In other words, you’re welcome!